In 1922, Nancy Cook called ER to ask her to chair a fund-raising luncheon of the Women's Division of the New York Democratic Committee. ER accepted the invitation, and after working with Cook, invited her to Hyde Park. Cook then introduced ER to her great friend Marion Dickerman, who would soon become Cook's life partner. The three women quickly became inseparable, sharing political and social friendships. FDR found them good company, smart and politically useful. Soon Cook and Dickerman became frequent visitors to the Roosevelt Hyde Park estate where, in 1925 the three friends, with FDR's active support and assistance, built Stone Cottage at Val-Kill, two miles from Springwood, the Roosevelt family home. Once the home was completed, Cook, a master woodworker and craftsman, decided to make the furniture for the cottage. Soon the women decided to launch Val-Kill Industries, as ER later recalled in her autobiography, "primarily to carry out a theory" she and FDR shared "about establishing industries in agricultural counties to give men and boys a means of earning money in winter" and having "something interesting to do. "(1) All parties hoped the factory, a nonprofit entity, would not only provide jobs for rural workers who were unemployed or underemployed, but would also provide rural youth training for new kinds of work. In 1926, the women built a larger building near Stone Cottage and the following year Val-Kill Industries began selling colonial-style furniture reproductions produced by Hyde Park workers and designed by Cook. 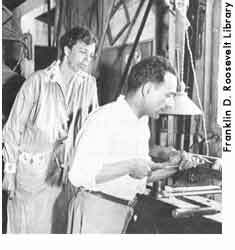 Later, they would expand the business to include pewter (Val-Kill Forge) and weavings. ER, who had the largest investment, marketed the furniture by holding showings at New York City and Hyde Park homes. In addition to ER's friends, project clients included Vassar College and Sloane's Department Store. Soon the press praised Val-Kill Industries as a "Feminine Industrial Success" and the project increased its work force from six to thirty. 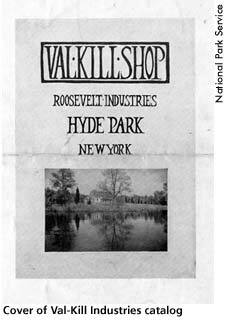 While it was never a financial success, Val-Kill Industries survived the stock market crash of 1929. ER continued to support the project after FDR was elected governor; however, after nine years, the factory closed when what Blanche Wiesen Cook calls a "frayed bond" developed in ER's relationship with Nancy Cook and Marion Dickerman. ER then had the factory building remodeled and converted into apartments for herself and guests. Eleanor Roosevelt, This I Remember (New York: Harper & Brothers, 1949), 33-34. Black, Allida M. Casting Her Own Shadow: Eleanor Roosevelt and the Shaping of Postwar Liberalism. New York: Columbia University Press, 1996, 16. Cook, Blanche Wiesen. Eleanor Roosevelt, Volume One, 1884-1933. New York: Viking Press, 1992, 323-5, 420. Cook, Blanche Wiesen. Eleanor Roosevelt, Volume Two, 1933-1938. New York: Viking Press, 1993, 360-1. Roosevelt, Eleanor. This I Remember. New York: Harper & Brothers, 1949, 33-34.